Have you ever considered growing your own food but don’t know where to start? Have no garden space? Think herbs – they are the perfect starter plants that are easy to grow, even inside. With a few pots in a sunny window you can have fresh seasoning for your meals available at all times! Here is a list of five easy to grow plants to share with you, plus a few details about how to use them. Chives – These are really easy to grow. Start them from seed (or dig up a clump from a friend’s house). Chives have a somewhat onion and garlicky flavor to them. They make a beautiful garnish for baked potatoes and fit well into savory recipes like mushroom risotto. Cut the stems close to the soil line and chop into fine pieces for use. Rosemary – This plant is an herb that is actually more flavorful when used fresh. Rosemary is delicious with almost any vegetable. Another use is in making your own herbal enhanced vinegar The stems are beautiful in a decorative jar. Make sure you don’t over water this plant and it will reward you with leaves you can pick all year long for your kitchen. Thyme – Thyme is a great woody herb to grow in your kitchen. It mixes well with most seasoning blends and is excellent in soups. The thick stems can be used for additional flavor but should be removed before eating. Alternatively you can simply pull the leaves off and give them a quick chop before adding them in. Thyme has a very strong aromatic smell. Parsley – As a garnish parsley is good, but don’t forget you can actually eat this fast growing herb as well. Think dishes that contain tomatoes, cucumbers and other vegetables. It also makes a nice addition to bean dishes. Parsley is very nutritious and makes an interesting texture addition to a salad (and will freshen your breath too!). Mint – Other than the obvious use in drinks (chocolate mint is my favorite tea) mint can actually be used in quite a few dishes. This plant is best grown in a pot because it will take over your garden. Mint can go well in savory dishes. I prefer to use it in desserts – mint goes well with anything chocolate! You can also make a delicious mint whipped cream to use as a topping. 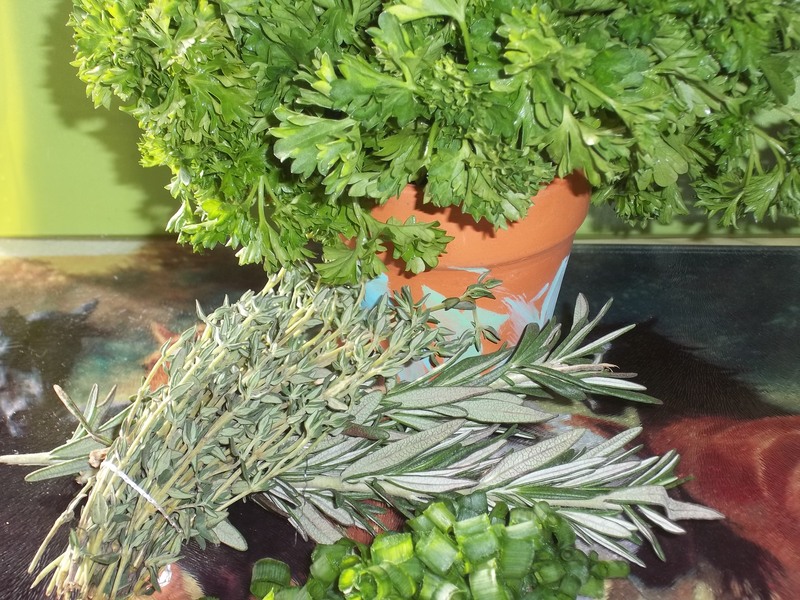 Growing your own herbs is easy and rewarding. Simply pick a small pot to plant the seeds in, fill with moist potting soil and sprinkle the seeds. Keep your herbs moist, but not sitting in standing water. Most herbs love a south window but will adapt to any brightly lit area. Make sure you keep the end pinched off to prevent them from getting too tall and encourage bushy growth. Remember when you are cooking with fresh herbs that one teaspoon of dried herbs should be replaced with a tablespoon of fresh herbs. Feel free to experiment with recipes and uses – and of course expand your indoor garden once you’ve mastered these herbs. We would love for you to share favorite recipes in comments below! 5. Tea Tree Oil – A little bit of this ingredient goes a long way for super antibacterial and anti-fungal properties. Tea tree oil is an essential oil with a very distinct smell. Use it to kill molds and in high moisture areas as a preventive. You can use it anywhere you would use a spray cleaner. Dilute it by adding 1 drop per 1 ounce of water. You can add some liquid soap for an extra cleaning boost. As a bonus tea tree oil can also be used in your bath, for acne treatment and even in a vaporizer when you are sick. 4. Castile Soap – Liquid Castile soap is great for many uses. It’s a stand-alone cleaner or can be mixed with other ingredients. It’s made from vegetable based fats and is very gentle and biodegradable. It’s also very thick and concentrated, which means it lasts a long time. 3. 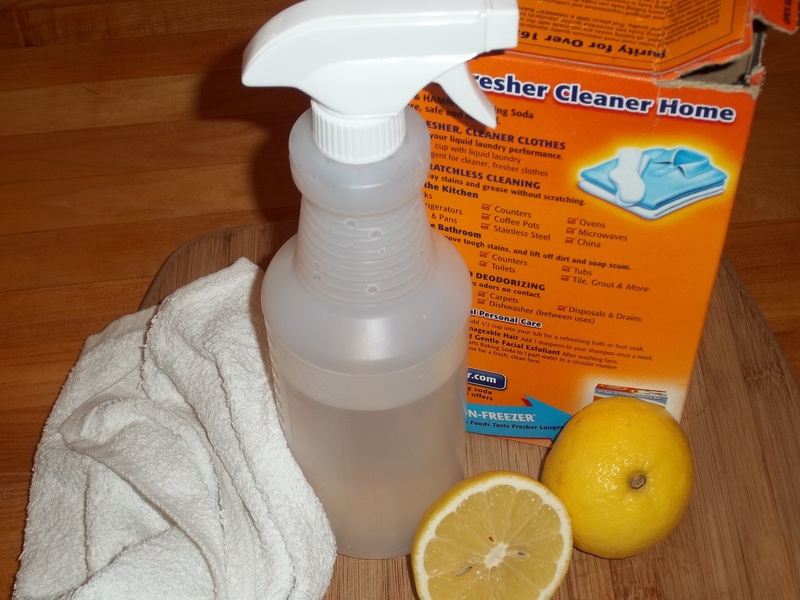 Lemon Juice – Lemons are great natural cleaners that have the bonus of also smelling good. You can use fresh lemons or keep a bottle of pure lemon juice in the fridge. The juice can freshen drains, acts as a natural bleaching agent and can even help remove stains from your plastic containers (tomato sauce anyone?). You can cut a lemon in half, dip it in baking soda and use the lemon as your scrubber. Run it through your disposal when you are done for a second use. 2. Baking Soda – Baking Soda (the kind you cook with) is one of the most versatile cleaners on the planet. It makes an excellent gentle scrub (mix it with water and/or lemon juice). It deodorizes, works in laundry, carpets, floors, removes stains, polishes and cuts grease with ease. It is gentle on the hands and comes with no odor. It’s also great for skin rashes and upset stomachs. Simply sprinkle it on and wet it enough to make a paste. 1. Vinegar – This is my absolute favorite green cleaning tool and almost all of my homemade cleaners contain it. Don’t be put off by the strong smell; it quickly disappears as it dries. Distilled white vinegar is easy to find in your grocery aisle and is inexpensive. Dilute it with water and spray on almost any surface. It safe for baby and pet areas and is great for killing germs and cutting through grease and stains. These 5 ingredients should start you on the right path to green cleaning at home and also save you some money. We all have our reasons for wanting to go green – I would love to hear your favorite cleaning tips in the Comments below, happy cleaning!